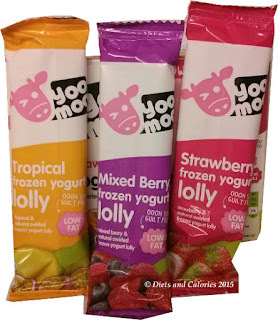 Yoo Moo Ice Lollies were an impulse buy in Tesco recently. I loved the look of the pack. Bright, colourful and apparently healthy, plus they sounded so tasty. 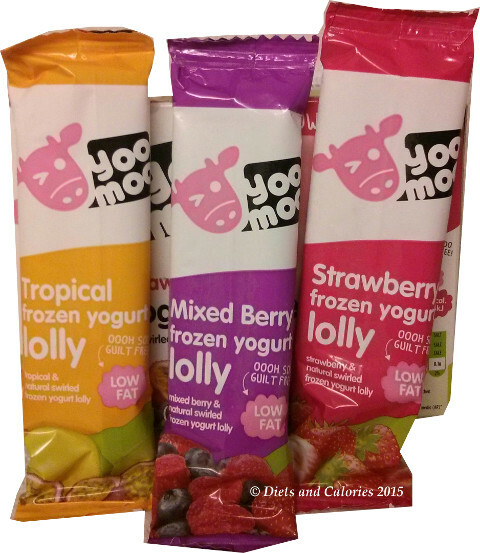 There are three different flavours of yogurt ice lollies: Mixed Berry, Tropical and Strawberry. Each ice lolly has 74 calories. Each box contains 6 x 55ml (small) ice lollies and there are two of each flavour. 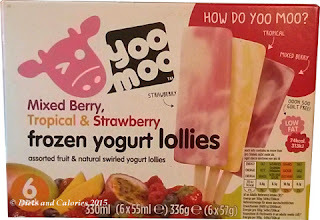 The description on the front of the pack says they are assorted fruit and natural swirled yogurt lollies. Other information states ‘low fat’, Ooh soo guilt free. Glancing at the traffic lights on the front also reveals three green lights and one amber light for sugars. So on the face of it, this would seem to be a reasonably healthy treat for a hot day. However, I can’t say I was overjoyed to read the ingredients. The main ingredient in each lolly is yogurt (65%). But for each flavour, next in line is sugar, followed by glucose syrup! Two types of sugar! Why? This is a real shame because the fruit itself should be sweet enough. The fruit flavour is made from actual fruit puree, but accounts for less than 10 percent of ingredients (see ingredients list below). The calories are low, which is good, but they are small lollies. 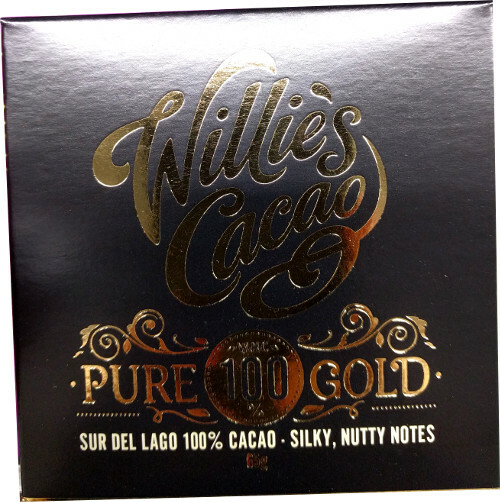 They have a lovely flavour and are of course sweet, so naturally appeal to children. They’re quite hard to bite into straight out of the freezer, but once they’ve melted a bit, become a bit creamier. Although they taste nice and have pretty packaging, I don’t think I’ll be buying these again as it’s so easy to make these myself but without the glucose syrup and sugar. Found in a branch of Tescos on offer at 2 for £3. 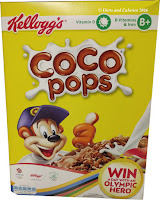 Nutrition information per 55ml lolly (Tropical Fruit): 74 calories, 0.8g fat, 0.5g saturates, 14.9g carbohydrates, 10.9g sugars, 0.3g fibre, 1.6g protein, 0.1 salt. Nutrition information per 55ml lolly (Strawberry): 73 calories, 0.8g fat, 0.5g saturates, 14.5g carbohydrates, 10.5g sugars, 0.3g fibre, 1.6g protein, 0.1 salt. 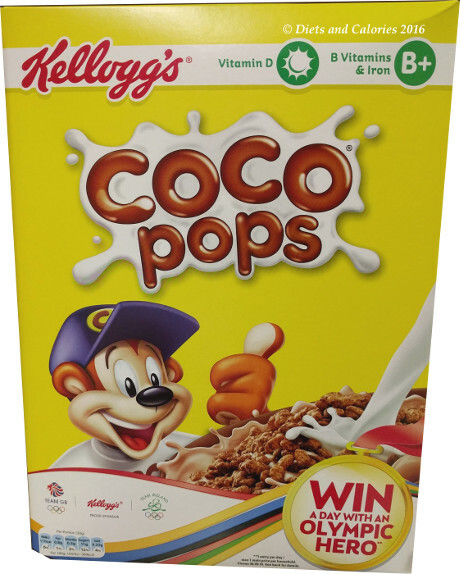 Nutrition information per 55ml lolly (Mixed Berry): 74 calories, 0.8g fat, 0.5g saturates, 14.7g carbohydrates, 10.7g sugars, 0.3g fibre, 1.6g protein, 0.1 salt.